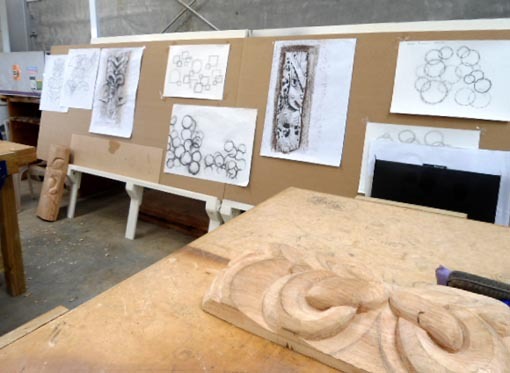 Israe Paraone – experienced carver, tohunga, retired teacher, researcher and adult learning facilitator – is teaching carving to prisoners at Northland Region Corrections Facility and driving opportunities for them to gain formal qualifications in carving. In August, Israe (Ngati Awa, Tuhoe) was appointed to the new role of Director Whakairo at Northland Region Corrections Facility. 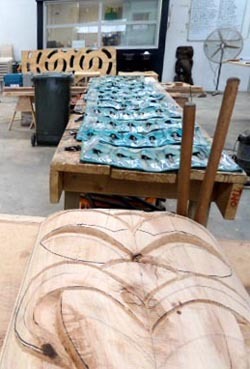 Since then, he’s worked to define the role of whakairo (carving) within the prison and establish a whare, all the time focusing on the needs of the men he is working with. “The men are all so different and their needs are incredibly diverse,” he says. “Being in prison doesn’t automatically categorise or bring them together. What they do tend to share are educational challenges – which in itself is a challenge for me as the facilitator of their learning. Unlike most teachers, Israe hopes that these men won’t return once they leave NRCF. Instead, he hopes to give them a sense that the world on the outside has so much more to offer than the world on the inside. Working with a range of prisoners and abilities, Israe’s role is to ascertain how far he can extend each individual – from literacy levels through to finding their emotional limits. Each lesson begins with a karakia (invocation) and then a group discussion about what is expected from them for the day. When he started, Israe says, it took a while for the men to open up. But within a couple of months, he had them all putting up their hands to ask questions and explore the materials they are using. He often begins a class with a carving demonstration and then the men are encouraged to imitate what they have observed. His aim is to lead by example, as both a human being and spiritual guide. Israe describes carving as a physical artform that embodies Maori philosophy. Israe believes a strong educator needs to lead by example and acquire the respect of the people they are working with. He spends time with the men, maintaining the whare with its kawa (protocol), and sharing lunch as they discuss their work. Prison, like all structured environments, can be a cocoon, and Israe understands how routine it can become for the men. But he tries to challenge them to step out of their comfort zones. He sees carving as a way for the prisoners to express themselves but also to communicate with each other and with themselves. By practising analysis and critique of their work, they are analysing themselves. Israe’s vision for these prisoners includes building relationships and mentoring opportunities with the business community so the men can learn how they might sustain themselves when they are released. Original generation time 1.1919 seconds. Cache Loaded in: 0.0005 seconds.